Bankruptcy laws were put in place to help people start over with a clean slate by wiping out all their debt. However, the bankruptcy law changed in 2005 making it more complicated with more factors to consider. The decision to file for bankruptcy is a difficult one fraught with a lot of emotional considerations. Filing for bankruptcy can affect your credit, your self-esteem and your ability to purchase things or obtain a loan for a period of up to ten years. This decision should not be taken lightly. This guide will help you decide if bankruptcy is the way to go and how to take steps to file. Before you leap into Bankruptcy you should weigh the pros and cons. Bankruptcy will negatively affect your credit for up to ten years. You may lose some of your property and belongings. All your credit cards will be taken away. You will not be able to get a mortgage for many years. Bankruptcy will not erase student loans. You will have to explain your situation to a judge. You may have to pay back some of your debts. If you have a co-signer, bankruptcy does not alleviate their portion of the debt and they have to continue to make payments. Filing for Bankruptcy is a pretty quick process. You should be able to stay in your home and keep most of your possessions. You might be able to apply for credit within three years but at a much higher interest rate. Debt collectors will be ordered to leave you alone. There is no debt limit to how much you must owe to file. Certain banks lend to “bad risk” borrowers, so you do have options. There are limitations of how often you can file for Bankruptcy, but you have the choice of Chapter 7 or Chapter 13. Do you have any other options such as borrowing money from a friend or family? Contact creditors and ask if you can work out better terms or a payoff deal. Consider a short-sale of your home or other assets to free up cash. Have you contacted a debt consolidation or consulting agency? There are two types of bankruptcy, Chapter 7 and Chapter 13. Chapter 7 applies to individuals, and it includes liquidation of your assets to pay off creditors, or you can choose repossession. With Chapter 13, you work out a payment plan based on your reliable source of income to pay off your creditors within three to five years. Businesses can file a Chapter 11 type or file under Chapter 7. You choose to hire a bankruptcy attorney to help you figure out if the decision to file is sound and which type best fits your situation. 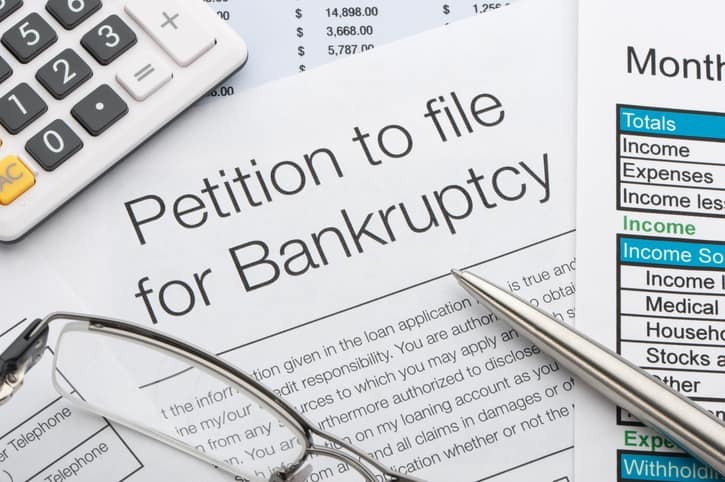 There are ninety bankruptcy districts in the United States. Each state has at least one district. You can find your district in our bankruptcy section. It is prudent to have all your financial documents ready; you will need them for this process. Gather together your tax returns for the last few years, pay stubs, deeds to land, titles or ownership paperwork related to any assets (cars, homes, motorcycles, boats, etc.) and liabilities such as loan documents, mortgage statements and keep everything handy. The first step is to take a means test to find out which type of bankruptcy you qualify to file. You can obtain the forms from your district bankruptcy court or download them online from the U.S. Courts website. You will need to fill out a 22A-1 form which calculates your income versus your debts. Then you will need form 22A-2 which helps to determine which type of bankruptcy is right for your situation. You may also need to fill out form 22A-1Supp to see if you are exempt from the means test due to recent military time served or if your debts are related to business expenses. If you do qualify, you will then need to download or pick up the packet of bankruptcy forms and fill them out. They detail your debts, assets, and income. Once you have completed them, you will need to deliver these forms to the bankruptcy court in your district. Once you file your paperwork, the court will assign you a trustee. Their job is to intervene between you and your creditors and ease the process. They will help determine which assets may be liquidated to pay off debts. They may also schedule a 341 meeting where you sit down with your creditors to work out terms and repayment options. In many states, you are required to attend credit counseling approved by district court. Upon filing, the court will issue a stay of foreclosure and prohibit creditors from hounding you. However, to finalize the bankruptcy process, in most U.S. states you will also appear before a judge to receive final approval of your bankruptcy and repayment plans. If the judge awards you a bankruptcy discharge then you are free from paying certain types of debt. This discharge order is permanent and your creditors can no longer contact you about repayment. You can choose to repay discharged debts or not, but regardless any payments you make after filing bankruptcy should be well documented. You want to make sure once you recover from the process, you can show creditors your efforts of repayment. Going forward, you might want to consider taking a money management class, making budgets and simplifying your life to more efficiently manage your finances, so you don't have to go through this life-changing process again.